Instead of a heavy multi-tool with a host of options no fisherman needs, consider the Pro Guide Camp Combo from famous lure maker Rapala the next you head for the lake or stream. This kit places a 5" (closed length) surgical steel filet knife and an 8" pair of long nose pliers right on your belt in a secure nylon pouch. The stainless steel knife, with a blade length just under 5" and big enough to handle most fish, locks in open position for safe work. The durable polymer handle is comfortable and easy to grip under wet and slippery conditions. Depress the locking lever and the blade closes safely with one hand. You'll need the filet knife mostly on the cleaning table, but if you string a wrist loop through the lanyard hole you can even use it for other work while you're hip deep in the river or leaning over the gunnel of your boat. 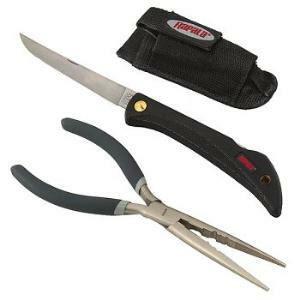 The pliers have been designed for fishermen, with extra long jaws for disgorging hooks, jaw spaces for crimping split shot, wire cutters on the side for rigging wire leaders, and smooth jaw flats for tuning lures. Nickel plated to slow corrosion, the tool steel pliers have cushioned handles for better gripping on cold days. The Camp Combo offers all the basics in a convenient pocket sized belt sheath.